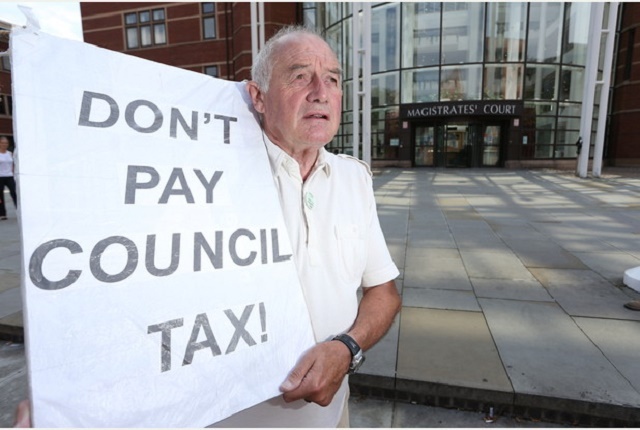 Ten days ago, Ross Longhurst, a 72-year-old Nottingham resident and activist, was sentenced to 28 days in prison for his principled refusal to pay council tax in protest against the austerity agenda of both the coalition government and the local Labour council. His brave action should be saluted, argues Steven Mahatma. 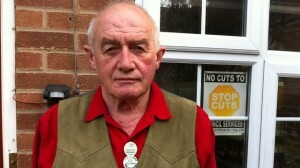 On Wednesday 12th March, Ross Longhurst was locked up for 28 days for wilful refusal to pay council tax as a Nottingham resident. His position is one of defiance against the austerity policies brought in both by the coalition government and local Labour councils – the latter overtly complicit in pushing an agenda that burdens the most vulnerable with the consequences of perpetual economic ‘crisis’. A significant portion of Ross’s anger at this state of affairs stems from the reality that the very young and very old are both under attack by cuts to public services. As Ross writes, ‘If only a handful of councils stood up for the people by refusing to make cuts then this would create a national political crisis which the Government could not ignore’. Local media coverage has already noted the fact that the state’s legal arm has imprisoned a man of 72 years of age, something which many have found an abhorrent and appalling act of malice considering the ‘offence’ is non-payment of the relatively minor £1,028 fine. Ross wishes to stand in solidarity with the 20,000 other local people currently harassed for being unable to pay their council tax due to the apparent crime of poverty. Poignantly, the coverage of Ross’s case went out on local TV media precisely at the time he was arriving at Nottingham prison. As a result, he received a warm welcome of applause from many prisoners – and, indeed, prison guards. He has spoken to friends and loved ones about how much solidarity he received upon entering prison, and of the continued well-wishing and handshakes during his detention so far. These inspiring stories, as well as letter-writing efforts by sympathisers and supportive demonstrations in Nottingham’s Market Square, stand in stark contrast to the talking-head propaganda emanating from Graham Chapman of Labour city council who brazenly told the press and public ‘We sympathise with Mr Longhurst’s protest against Government cuts to council funding which we also oppose as being disproportionate and unfair’. Such ‘opposition’ is clearly preserved for newspaper statements and not actual, meaningful, put-yourself-on-the-line-to-stand-up-for-something action. The insincerity of Chapman’s crocodile tears is nothing less than adding further insult to injury, as Labour thrust through widespread cuts, which fail the very people they were elected to serve. Chapman went on to say, ‘We have a legal duty to collect [council tax] and so had no option but to bring this case to court.’ Of course, Chapman says nothing of a government’s ethical obligations to ensure people do not require food banks or that school budgets aren’t slashed or women’s shelters are not shut down. He speaks, as always, in legal or economic terms far removed from the needs of the people, with not a glimmer of principle about him. The harsh truth is that the majority of Supporting People services have been cut, in Nottingham and elsewhere. These services offer accommodation and support that address a wide variety of needs; including homelessness, mental health, substance abuse, domestic violence, ESOL courses, learning disabilities, HIV, welfare and older people. As a result of closures to accommodation-based services, Nottingham City does not have sufficient bed spaces for women fleeing domestic violence and rough sleeping is visibly on the increase. Of course, cuts to Supporting People services are a false economy: these closures increase demand on the State sector through hospital admissions, police intervention and custodial sentences, child protection and safeguarding. People like Ross Longhurst are taking principled stances against systems which are literally killing the most vulnerable of us and causing all but the most wealthy to suffer. The author was assisted by Sam D and Ben C.
Steven Mahatma is based in Nottingham, UK. He's interested in gender issues, anti-capitalism and any number of things. He could be called an 'activist' but while politicians are called the same this makes him uneasy. Excellent article Steven ( and Sam & Ben). Surely this will simply mean £1,028 of further cuts? Not the most effective protest I’ve witnessed. Thank you, I hope to write more regularly. And yes! I will coming to the bell hooks discussion event. I’m a fan! The logic you propose is one whereby people do things because they are held hostage by the threat of worse things if they don’t. I think there are other options. Further, if non-payment of council tax, which applies to 20,000 people in Nottingham, reduces the cycle of re-funding public services, surely the system is currently failing (the people), or has been designed to fail? Why participate in such a charade? Also, my understanding is that the state continues to seek unpaid funds after a person’s release from prison, so we may not have heard the last of this story. Out of curiosity, what would you advocate as a form of effective protest? Public services have not been designed to fail, they simply can’t survive if funding is withheld from them while they’re still expected to provide the same services. Sure that’s basically the belief that has inspired this protest in the first place? If you’re complaining about money being taken away from a system and you are yourself withholding money from that system, public service funding isn’t exposed as a charade, you just end up further underlining how impossible it is to do things sustainably without sufficient finance. Funnily enough, I’d argue a more effective protest would be to find ways of actually increasing funding for the council, rather than withholding it. Take your pick really, a bankers’ bonus tax, a financial transaction tax, a congestion charge, a mansion tax, higher inheritance tax, higher income tax, higher business rates or whatever. Basically any form of protest that, irrespective of its level of success can’t end up withholding over a thousand pounds from services you purport to defend. The logic you propose is one whereby people do things because they are held hostage by the threat of worse things if they don’t. I think there are other options. Some of those options you propose and are entirely supported by myself. I have been involved in these campaigns, they are not mutually exclusive.